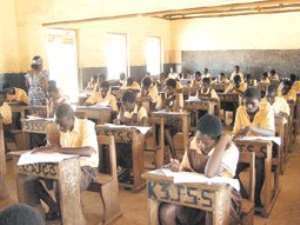 Statistics available to The Chronicle on the 2004 Basic Education Certificate Examination (BECE) has indicated that the total number of candidates for the exams is 278,413. The number increased by 3.64% over the 2003 figure. This was made up of 152,871 boys, representing 55% and 125,542 girls, representing 45%. The Ashanti Region recorded a total candidature of 56,077, the Greater Accra region recorded 55, 589. The Eastern Region recorded 33,387, the Central Region recorded 29,144, the Western Region had 26,801. The Volta Region recorded 24,584. The Brong Ahafo Region had 24,027. The Northern Region recorded 15,094. The Upper East recorded 8,288 and the Upper West had 5,422. There were 7,428 schools participating in the examination and there were 1,038 examination centers. Some of the examination centers toured by The Chronicle included the St. Thomas Aquinas Secondary School, Labone Secondary and Accra Girls Secondary School. At the Accra Girls Secondary, which was a centre, The Chronicle met the Director General of the Ghana Education Service, Rev. Ama Afo Blay and the Head of the Ghana National Office of the West African Examinations Council (WAEC), Rev. John Annan Adotey. In an interview with this reporter, the Director General said, due to the impasse in the issue of the leakage two years ago, they had put in place mechanisms to check them and made sure that it did not repeat itself. "Everybody is anxious that we do not go through the tremor we went through two years ago." "Now, everything is on course. The structures we put in place are working and am happy we have sought out things so far," she added. The Head of the National Office of WAEC attributed the leakage to weakness in the human system and said they were going to review the system and put certain mechanisms in place to ensure that those weaknesses were no longer in existence. He emphasized that they were conducting leakage free examinations. "We have some honest people," he said and asked that when candidates heard of any leakage, they should report it so that remedial actions could be taken to prevent that paper from spreading all over. He advised that parents resist the temptation of buying examination papers or encouraging their children to do so. "The problem should be put on the adult population and not the children," he said. Some of the students the paper spoke to said the questions were right and within their expectations. They complained however that the invigilators were too strict. Asked if they had had any leakages, they said they hadn't. They are writing two papers in a day for the next four days. As the candidates write their maiden major exams in their school life, stakeholders and parents wait with baited breaths, praying that what befell last year's candidates was not repeated in the course of the five-day exercise. It would be recalled that two years ago, the whole BECE was cancelled because of a reported leakage of exam papers which damaged the integrity of the exercise. The candidates had to resit for fresh papers. Their performance in this examination would determine which senior secondary school, candidates would be admitted to eventually.